"Now British scholar pours water on 'fake' papyrus text that claimed Jesus had a wife." See the full article at the Daily Mail. "New Testament scholar Professor Francis Watson of Durham University says the fragment, which caused an international sensation this week, is a collage of texts from the Gospel of Thomas, copied and reassembled out of order." 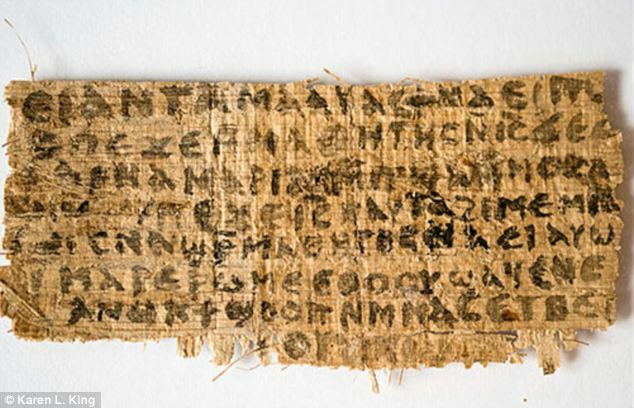 A Harvard Divinity professor, Dr. Karen King, brought the papyrus into the spotlight. Scholars dated it to the fourth century AD (300s) and said it was probably from Egypt. As soon as I saw the headlines earlier this week, I knew there would be LDS members getting excited that this was proof that Jesus had to marry to achieve godhood. But keep in mind that if the manuscript is not a forgery, it was written well after the time of Jesus and even Dr. King said it isn't reliable as a biography compared to the other sources we have.